PDF of the entire issue (6.68 Mb). Executive Director Romain Murenzi: We’re only starting to unlock its potential. Vaccine prices rise. How meat hurts the climate. An African moon mission? 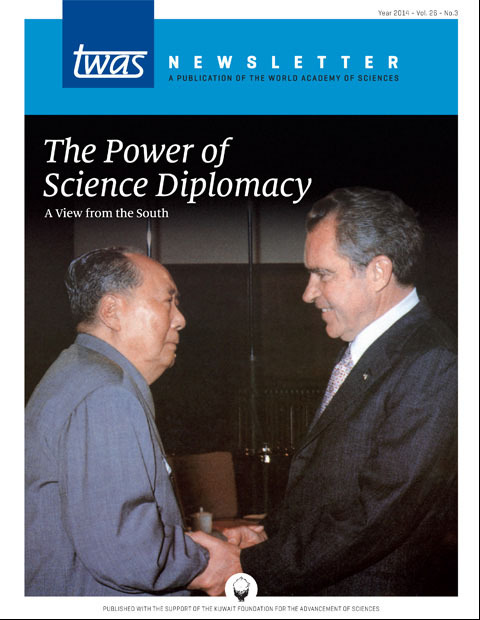 An emerging perspective on science diplomacy reflects the South’s different history and different needs. Q&A – Science diplomacy is yielding new advances in the developing world. Could science diplomacy help Central Asia and India cope with climate change? At a 50th anniversary event, high-level leaders celebrated the Centre’s global accomplishments – and TWAS’s contributions. Science and diplomatic leaders from Italy, Africa and TWAS celebrated their historic partnership – and future cooperation – at an event in Rome. Arsenic in rice threatens global health, says TWAS Prize winner Zhu Yong-Guan. Scientists and students explored new research on the Asian storms at a workshop organized by the Chinese Academy of Sciences and TWAS. A new film shows the excitement of young researchers from the developing world who study and work at five Beijing-based centres of excellence. The beauty of maths, says the influential scholar, is its power to solve problems. How Yemeni scientist Abeer Ahmed Qaed Ahmed achieved a difficult mission.